Shelving - from simple designs to thick "floating" shelving in a choice of materials, including natural wood, MDF or real wood veneered MDF. Storage and fitted furniture - from decorative small units, to fully fitted shelving and wardrobes in a variety of styles, materials and finishes, and all carefully designed to suit their context and a variety of tastes and styles. Windows - supplied and fitted in a range of styles. We have a particularly strong track-record in traditional sliding box sash windows, and can offer services from repairs and renovation, to draft proofing, to complete new single or double glazed windows. We have developed a method of draft proofing that has a minimal impact on the existing fabric and which is visually unobtrusive. This system uses brushes rebated into the sides of the sashes, meaning that they are hidden from view and also substantially improving the ease with which the window can be opened and closed. We also have expertise in the careful restoration of listed building windows, insuring minimal replacement and maximum preservation of existing materials and therefore character. Floors - a choice of flooring from traditional solid planked floors, to engineered and laminate flooring, to manufactured sheet flooring. Skirting and Architraves - including hardwood, two or more part and special order runs. Garden and Outdoors - a range of different fencing and gates and also custom made garden furniture, sheds and decking. We also offer a wide range of first fix carpentry services including structural alterations / repairs and cut-roofs. We can supply and fit a range of quality made to measure joinery products, including doors, windows, stairs, fitted furniture and kitchens, all made by skilled local bench joiners. We provide a wide range of kitchen services, from fitting and installation only, to supply and fitting, to main contracting the whole project from planning and design to final completion. 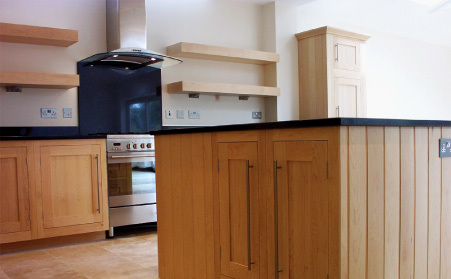 We are able to cater for most budgets and needs, from a simple makeover to bespoke hand-built kitchens. Our picture gallery illustrates some of the work we have undertaken previously, and shows the quality and attention to detail for which we have gained a reputation. 3f2 Carpentry offers a range of services from minor internal alterations such as removing or adding a wall to full-scale renovations, extensions/building and loft conversions. We can supply and manage all necessary trades including electricians, plumbers, plasterers, tilers and roofers. We recognise the importance of ensuring that all necessary regulations and standards are adhered to. This not only ensures appropriate standards of workmanship and safety, but also avoids complications when buying and selling property. We are happy to advise on building regulations and planning requirements where appropriate. We can also liaise directly with the relevant authorities, and where needed can assist in the drawing up and submission of any drawings and plans. 3f2 Carpentry has full public liability. We recognise that the building industry makes a very significant contribution to global warming and climate change. The materials used often cause pollution and use high levels of energy in their extraction, manufacture, transportation and use. High levels of waste are also often commonplace at many of these stages. Furthermore, it is important to carefully consider the final atmosphere and health of the home once a project is completed. To this end, we source our materials carefully and install them to be ensure fitness for purpose, a healthy and safe environment and longevity. We try to minimise waste through careful ordering, and dispose of what waste cannot be re-used or recycled as responsibly as we reasonably can. Our timber is almost always sourced from sustainably managed forests. This approach is applied to all our conventional and standard everyday work. However, we can happily go much further should customers require. For example, we can advise on non-standard green eco-friendly building materials and practises, which are becoming increasingly comparable in price to traditional materials. We are happy to consider re-use and recycling of materials. We can also modify our building methods, including finishes and decoration, to ensure they are as environmentally friendly as possible. We would be happy to provide any advice to interested clients. On a wider level, we have over the years undertaken a range of interesting and unusual projects, including architectural joinery, and are always happy to hear of new challenges. We are resourceful, creative and good at problem solving, so please do let us know if you have any such projects or ideas, and we may be able to help make them a reality.